Ideal for use in nurseries and primary schools, our Round Tip Paint Brush Coloured Handles are an effective resource to have on hand. Manufactured with comfortable wooden handles, each one has a bold colour finish to attract younger artists. 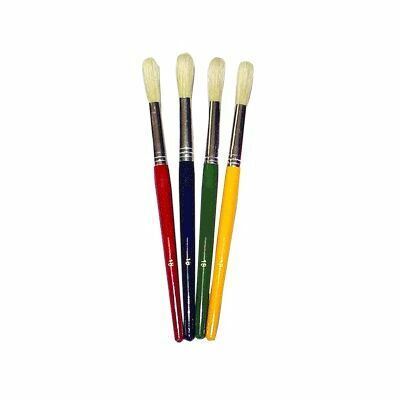 Presented in a size 18, they are set with hog bristle brushes cut to a round tip and allowing the user to make a range of different marks during use. Presented in a set of 4 - suitable for smaller classrooms - give them the essentials tools to create the most engaging and exquisite art pieces imaginable. Colours supplied: Red, Blue, Green and Yellow. Here at Gompels, we have a wide range of options available for busy crafting classes. From our Powder Paint through to Gompels Ready Mixed Fluorescent Paints, you'll find the perfect resource right here for exceptional wholesale prices.